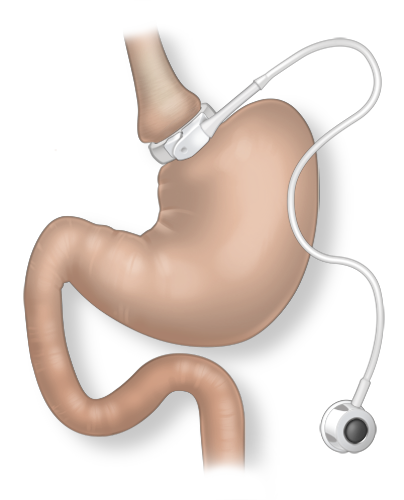 Laparoscopic gastric banding is an operation that aims at long-term weight loss. The operation was first approved by the FDA in 2001. It is a bariatric surgery operation that was popularized during the first ten years of this millennia and was initially very popular but has been largely replaced by the sleeve. Although the band was granted wider application by the FDA in 2011, the lack of insurance carriers supporting bariatric surgery for patients with a BMI between 30 and 35 made this approval irrelevant. Dr. Belsley no longer offers laparoscopic gastric banding to his patients. Laparoscopic gastric banding is a surgery that reduces the capacity of the stomach with the help of a silicone ring and an inflatable balloon that is fitted on the outside of the stomach. Thin and kink resistant silicone tubing connects the balloon to an injection port. The band is fitted about 15 mm below the gastro-esophageal junction and divide the stomach into a small upper pouch and lower stomach. The balloon inflates with the injection of fluid through the injection port. This narrows the opening of the upper pouch, wherein the amount of food you eat is controlled while the emptying process of the stomach pouch is slowed. Injecting or withdrawing this fluid through outpatient visits can adjust the size of this opening. An analogy to the lap-band’s function in digestion can be made to a toll-booth on the highway. They both eventually allow everything to pass but cause a slow-down with a purpose. The degree to how much things are slowed down can be controlled with adjustments of the laparoscopic band. Adjustments are decided by the speed of weight loss, a patient’s exercise routine and the amount and type of food that is typically consumed. With this feature, the band can be adjusted to the patient’s requirements to make them feel full and satisfied even with little food. With laparoscopic gastric banding, only four to five small incisions of 0.5 to 1 cm are sufficient to perform the surgery. These incisions are closed using self-dissolving sutures, leading to a rapid recovery time. Hospitalization is usually for a night where it is possible to resume regular activities within a week of the surgery. Laparoscopic gastric banding is performed under general anesthesia, which lasts for 30 minutes to an hour. As there is no stapling, rerouting or cutting of the involved in this surgery, it is considered to be a weight loss surgery that offers very little trauma. A small video camera is inserted into the abdominal cavity through these small incisions so that the interior of the abdominal cavity can be monitored on video monitors. Then with the help of long and thin surgical instruments, the surgery is performed with the surgeon viewing the inside of the abdomen through the video monitor. An added advantage of this surgery is that the stomach does not need to be stapled so that the risk of a ‘leak’ is minimized. The operation is reversible and gives the patient and the doctor more control over weight-loss. The fluid in the band can be emptied during pregnancy or if a prolonged illness occurs. It is adjustable and can be customized. There is no malabsorption nor dumping syndrome which makes it possible for the patient to fully digest vitamins and minerals. The success of laparoscopic gastric banding depends on the success of the surgery, and the ability of the patient changing their diet and eating behavior. These patients have to make long-term lifestyle changes in their diet and behavior by eating balanced diets and avoiding problematic eating patterns. The band is kept empty for the first six weeks after surgery to let the stomach heal, and the band adhere to the stomach firmly. If you don’t lose weight at an average of 1-2 pounds a week, or feel hungry, you may need to make an adjustment. It is important to drink at least 2 liters of water a day. One related caveat however is that liquids should not be drunk half an hour before a meal or during a meal. This is because this liquid can wash food through the stomach, and thus make you eat more food than you would without any liquids in your diet. There are some risks associated with laparoscopic gastric banding. The Lap-Band system may slip or twist out of position. Slippage induces reflux and affects weight loss and can be diagnosed by an x-ray. A re-operation may be required to reposition the band, and in some cases, band removal. Sometimes, the band may erode into the stomach by the stomach tissue over-growing around the band so that the band is inside and not outside the stomach. In such cases, the band has to be removed. Infection is a risk associated with all surgeries, and may require additional procedures or antibiotics. There may be broken ports and punctured tubing with laparoscopic gastric banding during the filling process. These problems can be easily fixed with an additional procedure. If the band is too small or too tight bands then it contribute to reflux symptoms with fluids backing into the esophagus and damaging delicate tissues. Persistent reflux problems have to be referred to the doctor immediately.